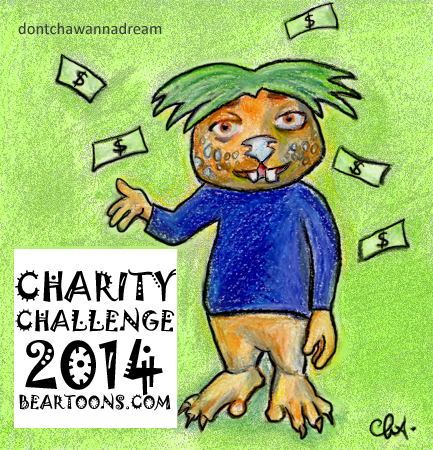 Bearman does that “to raise awareness of [his] blog while giving money to charities who need it”. If you want to be a part of it, here’s the link. Raising money for Bearman will be good practice for Fraz and his presidential fundraising campaign. I just hope that green comes out! Yay!!! I didn’t really think about that but you’re absolutely right!!! Yeah, you would have been all mashed up! lol And Binky Bearman… I’m optimistic. I’m sure we can find a solution. Bearman’s awesome. Love his charity challenge idea. Thank you! Well I think using the most famous wombie to promote Bearman’s charity challenge is enough. But of course, if Prince George wants to join!! Big hugs thanks for your support, Lauren. Eheh thank you, Andro!!! Was fun to draw this one. Big hugs and have a great week!! You did a great job on this one, Cha. Fraz looks great as a Bearman, and all for a great cause!